If you’re starting a business, upgrading an old Norstar phone system, or have multiple sites, business communication greatness awaits. All Electronic Key Telephone Systems have a Key Service Unit (KSU) … AKA “The Box on The Wall”. That box houses line & station cards, Voice Mail and the Auto Attendant and cost about $3-4K. That’s money you will save with a Hosted IP Telephone System because there is no box. It’s replaced by bigger, smarter boxes that live in our network centers. Why install and maintain TWO wired networks (Phone and PC), when you need only ONE – The LAN – that would happily support your Hosted IP Telephones? Or pay two different companies to maintain two networks? Why? Did we win a technical knockout? Or is the referee playing favorites? All 8 rounds have questions relevant to choosing new business telephones. Our range of Cisco IP Telephones stands up against any competition in terms of price, quality and features. Our service and maintenance costs will inevitably be lower than that of a Key Telephone System. Hosted IP Telephone Systems enjoy the largest growth in market share compared to traditional solutions. The simple reason is that they make sense. The world’s telecom networks ARE going 100% IP. Pull out your Key System Telephone service records for the last 3 years and add them up – is that more or less than $1700.00? Every time that shiny telephone van rolls up, it’s likely a $200 – 300 invoice that follows. Zero, or almost zero, truck rolls with a Hosted IP Telephone solution. And have you ever heard any of these statements? You need a new line card. You need a new station card. You need a second cabinet. You need a larger system. 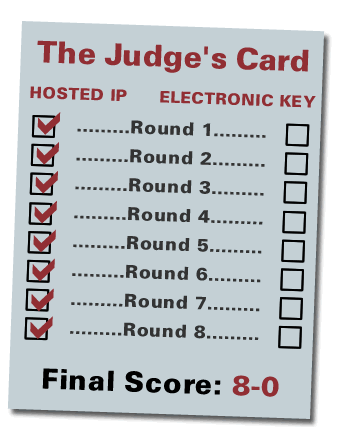 With a Hosted IP Telephone System, none of the above will ever apply. Can you easily transfer calls off-premise… to anyone? Can a central receptionist cover multiple sites? Can the boss have a mirrored extension at home? Can your iPhone or Android cell be an extension? Older Key Telephone Systems… impossible, or at great expense. Newer systems… maybe some of them. Hosted IP Telephone systems? All of them! Easy growth – vertical and horizontal. Add (or subtract) a phone as needed… or maybe you’re expanding to an office across town… is it costly to connect two systems together? With Hosted IP Telephones, they’re already connected. Software, not hardware, is name of the game. We upgrade our Hosted IP Telecom network core and add features on a regular basis. No charge. With a Key System, it’s probably a case of adding new hardware, and likely a truck roll. No Internet? You’re covered… The corporate Auto Attendant and Voice Mail still answer… and we can quickly divert calls to anywhere you choose. If WE go down…back up servers in Edmonton, Toronto or Montreal take over. Sure, a Key System can be made redundant… but what if there’s a fire, flood, or major catastrophe? With us, you’re covered. For more information, we’d love to talk with you… please call our sales number at 604.482.1225, or call me directly at 604.484.5269.